Samyang 20mm f/1.8 - did I expect too much ? I just received a new Samyang 20mm f/1.8. I planned to use it mostly for astro, also for landscapes and indoor shots with my K-1 Mark II. I just did a series of test shot outdoor in order to evaluate sharpness at infinity. Of course, focus was done in Liveview at max. magnification. I am not sure of the quality of my copy. not very nice, but maybe this is normal for a wide fast lens at this price point? At least, to my eyes there is no obvious decentering of the lens. I'm not surprised of what you get. Wider means more geometric distortion, which makes corners look even less sharp then they are. At some point I was interested in that 20mm prime, assuming that it would be better than my DFA15-30 @ 20mm, but after I compared the MTF charts, I realized that the DFA 15-30 was sharper across the frame. Also, with UWA lenses, we should only zoom-in to 50%, not to 100%, for the sake of preserving ourselves. The first thing that everyone does is to pixel peep as if this is how we look at an image. In real vision of a printed image, the resolving power of human vision is max in the center, with the perception of detail fading away at the periphery. (I now focus my interest on printing, this changes everything about how I perceive camera gear and photography). Last edited by biz-engineer; 04-15-2019 at 04:57 AM. Rectilinear vs “super-wide” can be unique labels for lenses. I got the 14mm version for similar reasons as yourself, but quickly discovered differences & qualities depending on K3 vs MZs vs adapted M43. How cool, huh? Tips for using super-wides will help you. Post processing can clean up some distortion. .... years ago, a different 20mm Vivitar analog era taught me how to shoot with them. Pointing higher on subjects usually added distortion. Subjects nearer lens periphery were less sharp etc. Then a friend shared a similar aperture, costly rectilinear lens with me, and the eureka moment happened!! I have been GASsy ever since! You may want to try your lens in APSC mode focusing on lens center area. Kudos to biz-engineer-good info! I agree! Humorous observation; astronomical objects vs pointy castles are in different photographic universes. You may not see geometric distortion shooting far away, tiny objects vs huge, towering nearby ones. Sorry for my rambling- need coffee! Good luck! It looks to me like you have a good copy. As you note, the lens seems well centered. The corners look decent for f/1.8, particularly for a 20mm lens. They will look even better if you adjust for lateral chromatic aberration. This is quite easy to do when processing a raw image, and it can make a big difference with wide angle lenses. Even the f/5.6 shot shows extreme CA along the edges. The edges will improve dramatically with better processing of the raw image. As for the "stretching" in the corners, that type of distortion is just a fact of life with a rectilinear wide angle. You can avoid it by using a fish-eye lens, but that will then introduce another type of distortion. Pick your poison. Thanks. I decided not to consider the 15-30 because of weight and price, I might reconsider my point of view then... Though I agree that in real-life situations the corner resolutions may be enough. I should test for coma before making my decision maybe, since bad coma correction is visible even with a small resolution view or print. Thanks dan this is reasuring. Good point about chromatic aberration, it would certainly improve things (in passing it is sad that DXO Photolab does not provide the corresponding correction profile). 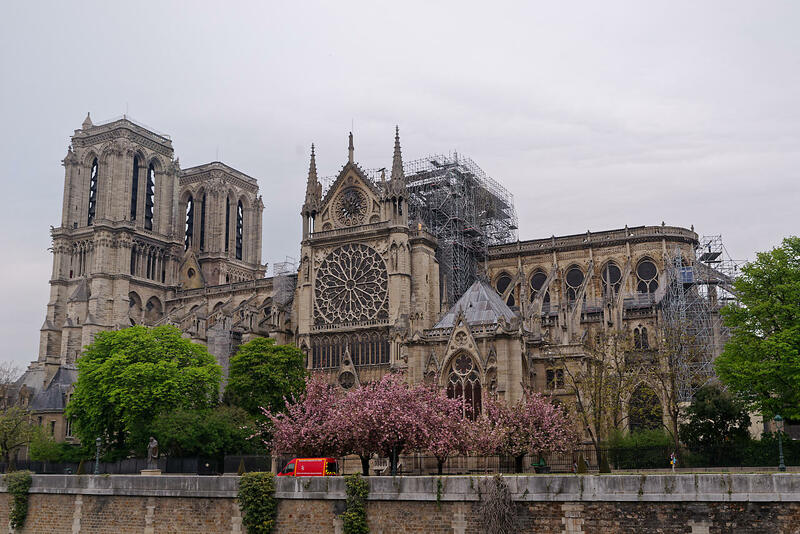 I know it's a off-topic, but I am incredibly saddened by the fire at Notre Dame. I looked at your example pictures with the scaffolding didn't even register until I saw the news just minutes ago. What a terrible loss for Paris and anyone who values culture and history across the planet. Indeed. This is such a saddening sight. Hopefully, they can at least rescue some of it. Rooting for the firefighters, and hoping no one comes to harm. Dan, you are lucky to have had the opportunity & treasure your pictures! Keepers and possibly priceless memories! My wife has been there, a long time ago, and was crushed by the news & spectacle today. Sadly, I may never get the chance now. Our sympathy is extended to all Paris for this loss! Stay safe & well everybody! Perhaps your photos would be of some use to the fire cause and origin investigators if taken just in advance of the fire. Displaying f/1.7 instead of f/1.8 is a Pentax thing. They all do that. Yeah, and my DA 35 f/2.4 shows as f/2.5 on one of my camera bodies (and in the EXIF) consistently. As for your 20-mil Samyang, I concur with what several other posters have noted: centring seems fine, and considerable fall-off towards the corners of resolution, contrast, and brightness levels is only to be expected wide open. Enough of which could probably be mitigated by careful post processing. DxO offers correction profiles for a fair number of Samyang lenses, I recall, so they might well come up with one for that particular lens eventually (particularly, when they deem there to be sufficient demand for it). BTW, F1.8 on an ultra-wide is not exactly the most likely use scenario for landscapes (nor even astro, I imagine)? If F5.6 to F11 looked meh, I would be much more concerned. Last edited by Madaboutpix; 6 Days Ago at 02:51 AM. Moi aussi. The world mourns. Regarding the Samyang, I did not test it yet past f/5.6 but at that opening it is not so good on the borders... sharpness drop starts to be clearly visible at 2048 pix wide even after careful processing in DXO.